Holy smokes I can’t believe it has already been a year since I last made this cake. 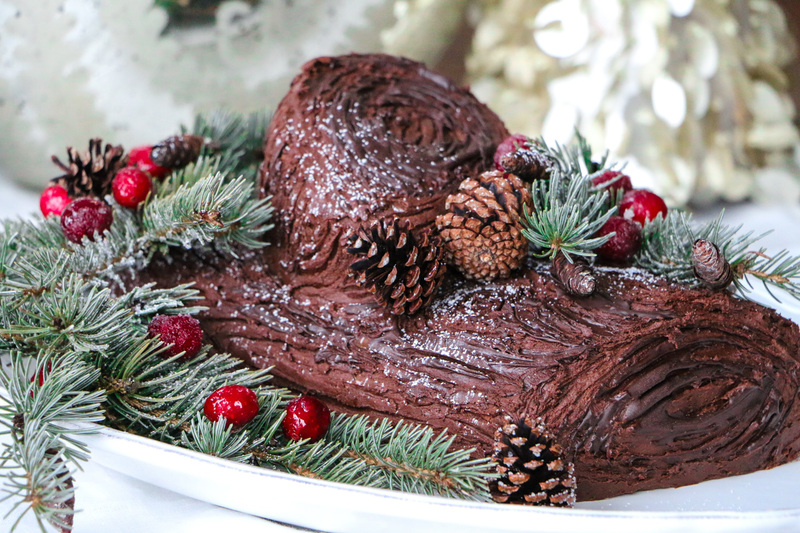 My third annual yule log has come back even yummier! Why you ask? Because… Baileys. Yes my friends, I soaked the cake in a mixture of Baileys and Amaretto, the chocolate whip cream filling is flavoured with Baileys, and so is the chocolate buttercream frosting! How can it get any better?? 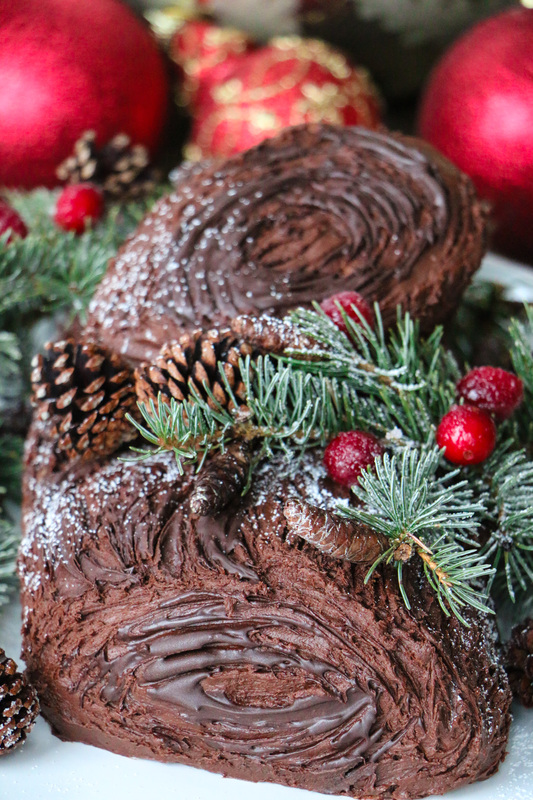 Maybe eating the cake with Baileys on the rocks would make this yule log out of this world! I don’t have much to write to describe the steps to making the cake because I made a video tutorial a while back (see below). It was my first time making a yule log and it turned out really well to my surprise. The video follows the basic recipe, so you’ll have to read the directions to see where and when to add in the delicious Baileys. 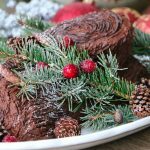 You can make this yule log with just Baileys or you can add some Amaretto for additional yumminess. This year I decided to roll the cake widthwise, because I didn’t have my large serving tray I usually use for this cake. When I make this next year, I will definitely roll it lengthwise. I really like how it produces a nice slim log and the log itself is long enough that you can cut both ends off to create branches on the side and on top of the log. Also, there’s less rolling going on, meaning the yule log won’t lose its circular shape. Since I rolled it widthwise, the cake ended up flattening out on the side (you can see in the picture), which was a bit disheartening to me. But have no fear, decorating the cake is where you can hide all its flaws. I searched long and hard this year to find some pine trees so I could use a few branches to decorate the cake. I actually almost fell into a valley trying to reach and snip off a branch. I know I feel bad taking branches from trees outside my yard, but I moved and all I have in my backyard are some skinny leafless trembling aspens. So, I had to… you know for the sake of the cake. If you do take some branch clippings, make sure you don’t do it to young trees. Anyways – since most of my decorations came from the outdoors, I thoroughly cleaned the pine branches and pine cones. I soaked them overnight to remove any debris and any creepy crawlies (if alive). I didn’t want any surprises with this cake – no thank you! You’d actually be amazed at how dirty the water becomes… so give it a few rinses until the water runs clean and removed any dirty looking pieces in the pine branches. While the branches are wet, sprinkle random areas with sugar and leave them to dry. This will give the pine needles a nice crystallized look. You can keep it pretty simple with some branches, but I like to add cranberries coated in sugar. It adds great colour to the cake. The easiest way to do this is to take frozen cranberries, soaked them in water, then rolled them in some sugar. The water will help keep the sugar coating on the cranberry. I’ve also seen people make meringue mushrooms, but I’ve never attempted this – maybe next year. They do make the cake look right out of the woods. I think I’ll definitely try that next year – along with a new yule log flavouring… like tiramisu or maybe gingerbread. If you want to make this cake ahead of time, the easiest way to go about it is to freeze the yule log before it is decorated. That way it eliminates any potential damages that could occur to the frosting or any delicate decorations. That doesn’t mean you can’t freeze a decorated yule log, it just takes some extra steps. Typically if I am freezing a completely decorated cake, I will clear an area in our deep freezer making sure I have a level surface to place the cake uncovered for a few hours. This will allow the frosting to harden so the cake can be covered in plastic wrap and frozen until needed. I recommend taking the cake out two days in advance, this allows the cake to thaw slowly in the fridge. If condensation appears on the plastic wrap, remove the plastic wrap and gently blot away any condensation that may be on the cake (without damaging the frosting of course). Prior to the cake being served, you can add more decorations to the cake if needed. This twist on the traditional Christmas yule log will have any lover of Baileys singing a holiday cheer. Preheat oven to 350 F and place the oven rack in the center of the oven. Line a 17 x 12 inch (43 x 30 cm) baking pan with buttered and floured parchment paper. While the eggs are still cold, separate the eggs, placing the whites in one bowl and the yolks in another. 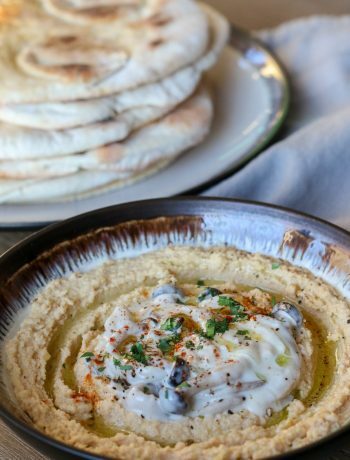 Cover and bring to room temperature before using (about 30 minutes). Meanwhile melt the chocolate in a heatproof bowl placed over a saucepan of simmering water. Remove from heat and cool. Using a hand mixer, add ¼ cup of sugar into the bowl with egg yolks. Beat until light and fluffy (about five minutes - when you slowly raise the beaters, the batter will fall back into the bowl in a slow ribbon.) Beat in the vanilla extract. Scrape down sides of bowl. Add the melted chocolate and beat only to combine. Using a hand mixer, beat the egg whites until foamy. Add the cream of tartar and beat at medium-high speed until soft peaks form. Gradually beat in the remaining 2 tablespoons sugar until stiff peaks form. Gently fold a small amount of the egg whites into the egg yolk mixture using a rubber spatula. Fold in the remaining whites just until incorporated. Don't over mix or the batter will deflate. Spread the batter evenly into the prepared pan. Bake until the cake is puffed, has lost its shine, and springs back when gently pressed, about 15 - 17 minutes. Remove from the oven. Place a second sheet of parchment paper on top of the cake and gently roll lengthwise into a log. Let the cake cool on the counter. In a small bowl, mix together Amaretto and Baileys. Unroll the cake and remove the top parchment paper (keep the bottom parchment on). Evenly brush the mixture over the cake and let it soak in while you make the chocolate whip cream. In a large mixing bowl place the whipping cream, vanilla extract, sugar, and cocoa powder and combine using a hand mixer. When soft peaks form, add in Baileys (you can also add in Amaretto if you want). Beat the mixture until stiff peaks form. Spread the whip cream and then gently roll the cake back into a log shape, peeling off the parchment paper as you roll (the cake may crack). Using the parchment paper, firmly wrap the cake (make sure you do not wrap too tight or the whip cream will spill out) and place seam side down. Place the log in the fridge for about 30 minutes to firm up. While the log firms up, make the buttercream frosting. In medium bowl, beat cocoa and butter on low speed until thoroughly mixed. Beat in powdered sugar until mixed, then add vanilla and Baileys until the frosting is smooth and spreadable. Take the log out of the fridge and remove the parchment paper. Trim one end of the log at an angle and set it aside. Then place the log, seam side down, on your serving platter. (You may want to cover up any exposed area on the serving platter area with parchment paper to limit any clean up). Gently frost the log and place the slice of reserved cake on top of the log or on the side. Frost the reserved cake. Leave the ends of the log unfrosted (if you want). Drag a fork across the entire surface of the log, creating knots and waves to resemble bark. Clean the fork with a paper towel after each stroke. To add darker bark details to the cake, dip the fork in melted chocolate and drag across the surface. 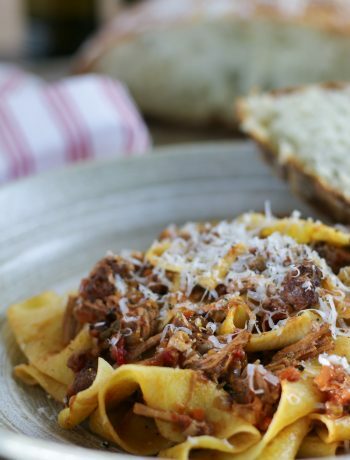 Cover and chill until serving time. 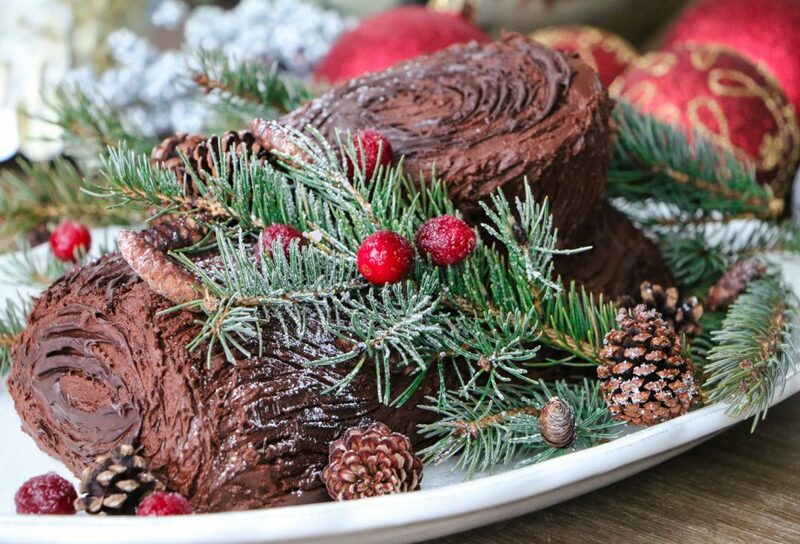 Just before serving remove cake from fridge, add pine or juniper branches around the log. Place sugar coated cranberries in the juniper or pine branches and place pine cones around the log. Dust with powdered sugar to create a snow effect.